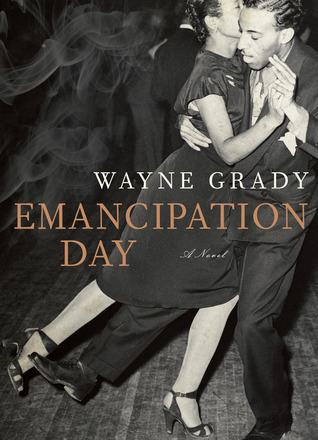 Wayne Grady’s Emancipation Day is a thought-provoking novel on race and racism in Windsor, Ontario in the 1950s. Jack Lewis is light-skinned enough to pass for white, and despite his mother’s protests that she never slept with another man, his father rejects him for the first month or so of his life. In the highly racialized society of his time, Jack grows up belonging nowhere – the black neighbourhood children refuse to play with him, and he resorts to bribing white children (who generally lived in a more affluent neighbourhood) to let him into their gangs. Jack desperately tries all his life to escape his heritage, even joining a band called the “All Whites” and identifying himself to everyone as white. The novel focuses on Jack’s relationship with Vivian, a Newfoundland woman whom he meets while in the Navy, and who marries him despite her reservations regarding his secretive nature. Even when she moves with him to Toronto and they visit his mother and brother in Windsor, she realizes there’s something off about what Jack has been telling her about his family, but she is unable to put her finger on it. “Why does you mom wear so much face powder?” she asks. And, more importantly, why didn’t Jack tell his family about her, and why can’t she meet his father? This is a powerful book, about a man struggling with his own identity, and kudos to Wayne Grady for not providing any easy answers, nor indeed for giving his characters a major, moralizing epiphany. On one hand, there are characters I wish had developed much more over the course of the book; on the other hand, Grady’s decisions reveal how much of an underlying problem racism continues to be, and how far people can go to escape their own past. Jack Lewis is far from a likeable character, but there are moments when he’s certainly a sympathetic one. His father once comments that Jack’s rejection of his family hurts Jack most of all, which is true, but at the same time, hurts so many others as well. Jack as well has a real temper problem, and the way he tries to control Vivian’s behaviour – at one point, Vivian suspects him of hiding her book so she wouldn’t read on a train and would instead talk to him – is deeply disturbing. Yes, we understand he has issues, but his inability to face up to these issues is making life miserable for so many other people. And, of course, as a reader myself, I found his taking offence at Vivian’s reading itself a petty, childish, downright offensive act. That being said, Grady gives us a glimpse of how much one’s skin colour determined one’s future at that time, particularly in Windsor where, as Vivian herself notices, the racial lines are heavily pronounced. We also get glimpses of Jack as a lonely child, unable to fit in anywhere, and seizing an opportunity at a better life. More complexity would have rendered his character more sympathetic – as it is, he has such outright, seemingly uncomplicated hatred towards his family for their skin colour that it’s difficult not to judge him as one would the KKK. When, during a race riot, he makes a single attempt to stop his father and brother from being attacked the ultimately leaves them to burn, we feel his pain, yet cannot help but judge his decision. Grady keeps the stakes deliberately personal – Jack’s fear at being found out extends primarily to his wife finding out. He is also concerned about his boss finding out and what that would mean for his future, but we don’t see enough of his professional life for this to appear a real threat. The result is that Jack’s behaviour towards the people in his life appears even more reprehensible, and one can’t help but want to urge him to grow up. Much more sympathetic is the character of Jack’s wife Vivian. Slowly learning about her husband’s family, despite his best efforts to keep it from her, she struggles with trying to get Jack to accept who he is, while at the same time, acknowledging her own, deeply buried, mostly latent, racial prejudices. It comes to a head for her when she realizes she’s pregnant, and has to deal with the possibility that not only will her child face racism all their life, but their own father may completely reject them as well. In a particularly striking scene, one of Jack’s neighbours presents her with a candy egg in mock celebration of her pregnancy. When split it half, the egg reveals a curl of dark chocolate shaped like a fetus. Vivian is forced to face her own personal prejudice against the idea, and more importantly, her realization that her family may itself find it difficult to fit in. Grady presents in harsh detail the racial tensions of the era, and leaves us with a relatively peaceful ending whose very calm is utterly disturbing. The discussion around this subject isn’t easy, and yet it’s an important one. A thought-provoking read, and Grady refuses to let his readers off the hook.